It was announced in November that the tyre plant would stop production by mid-2020. The Duke and Duchess of Cambridge will meet employees and their families at a tyre factory which is to cease production on a visit to Dundee. Michelin announced in November that the plant, which employs 845 workers, would stop production by mid-2020. 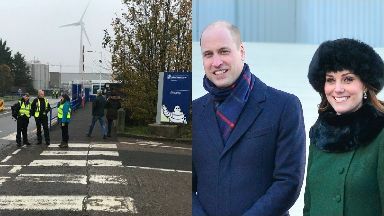 After meeting staff, the royal couple will attend a meeting of the Michelin Action Group, which is aiming to find and take forward solutions for repurposing the plant and providing a sustainable future for its workforce. Michelin has made a deal with Scottish ministers to repurpose the factory in an effort to secure a future in low carbon transport and manufacturing. The duke will make some remarks at the start of the meeting, thanking the action group for its dedicated work to date. The group meets regularly and includes representatives from Dundee City Council, the Scottish and UK governments, union officials, Scottish Enterprise and Michelin. On their visit to Dundee on Tuesday, the Cambridges will also officially open V&A Dundee, which opened to the public last September. The first V&A museum anywhere in the world outside London, the building designed by Japanese architect Kengo Kuma on the banks of the River Tay is the centrepiece of an ongoing #1 billion regeneration of Dundee's waterfront. In her role as patron of V&A, the duchess will make a short speech celebrating the addition of the centre for Scotland and the UK. The couple will also greet members of the public on the waterfront.